Anyway, the snow storm we got over the weekend, which dropped somewhere between 7-10 inches, has been dubbed the "snurlough" -- an odd combination of snow day and furlough. 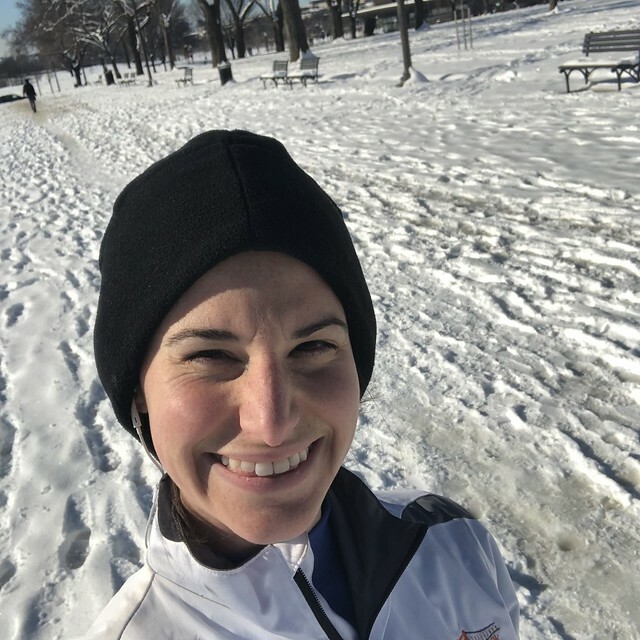 Since I am in fact still furloughed (shutdown day 24 over here), I took advantage of the gorgeous sun-filled afternoon to go for a snow run. 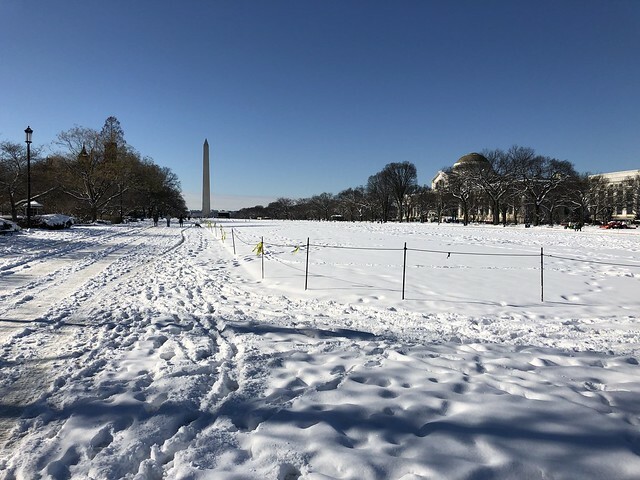 I dug out my YakTraks, which have been sitting with my running gear basically unused for the last four years, strapped them on, and headed down to the National Mall, where I hoped most of the paths wouldn't have been cleared of snow yet. I was in luck and most of the Mall was still completely blanketed in snow. The weather was perfect for a winter run. The sun was shining, there was no wind and it felt much warmer than the 32 degrees it was. I don't think I've had such a good time on a run in a while. Navigating the snow-covered paths on the Mall was a bit like a game. Some areas had great snow for running with my YakTraks, and I had really solid footing. Other areas were a bit too packed and icy, and I did some slip-sliding around. There were a few spots where people had tried to clear paths, and those areas were excessively muddy. I did some high knees to get through them and not have my shoes get soaked. 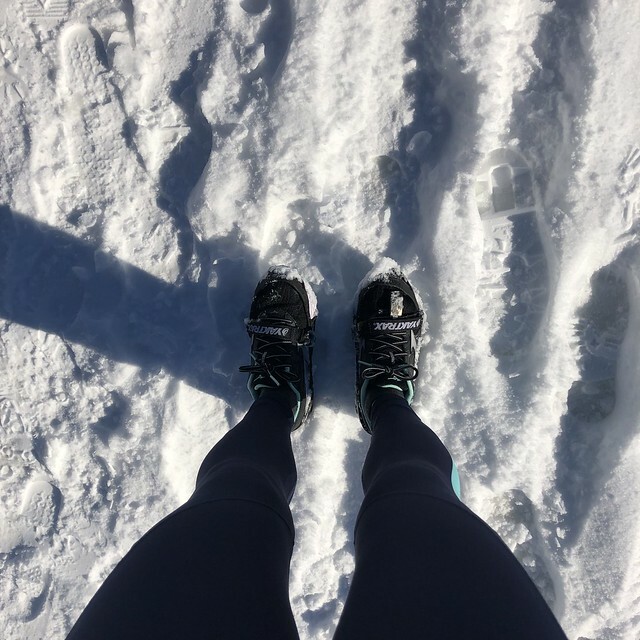 I had set out planning to do a quick three miles, but I was having such a good time enjoying the snow and the really gorgeous day, that I ended up adding an extra mile to the run because I wasn't quite ready to call it quits. I'm sure I will be a bit sore tomorrow, especially around my ankles and calves that were doing a lot of work to keep my from toppling over on the snow's uneven surface, but it will definitely be worth it. Today's run was just really great, and reminded me a bit why I love running so much. It was also a really great distraction from yet another furlough day. I'm jealous. I may try to get out on Wednesday, especially since we're supposed to have another storm the coming weekend. Hope the furlough ends soon! Snow runs like that are fun.